Encyclopedia of Minecraft® (formerly - Kubik) - encyclopedia about Minecraft for Windows and Mac. Encyclopedia of Minecraft® - a very useful program for Minecraft beginners and everybody who plays Minecraft. Kubik for Windows 7 / 8 / 8.1 / 10 as a desktop app (outdated). 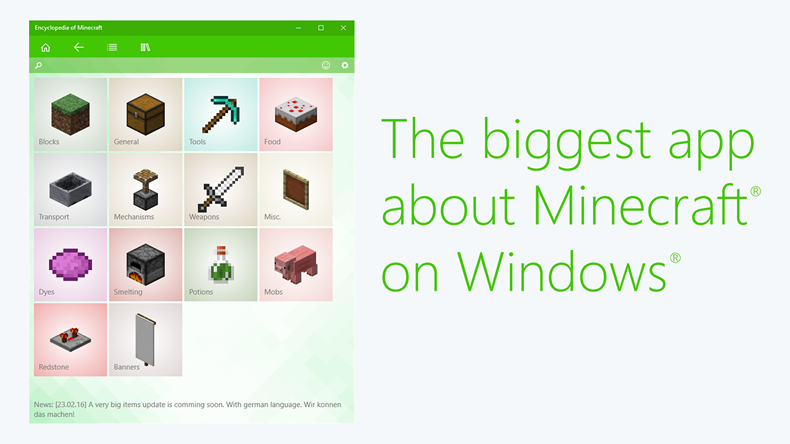 Encyclopedia of Minecraft® for Windows 8 / 8.1 as native app. Encyclopedia of Minecraft® for Windows 10 as native app. Note: Adobe has abandoned new versions of Air for Linux, use Kubik on Linux with wine. Encyclopedia of Minecraft® comes with a core plugin system. You can add own items to the app in a few minutes. - Can i select transparency of Kubik? - Yes. Click on settings (?) icon on top of main window. - Can i run Kubik over Minecraft in fullscreen (F11) mode? - No. Cause of system restrictions. There are not many programms (on C++, C#, Java) can work properly on Direct3D, OpenGl overlay. - I have strange bug (windows don't work, flashing, etc). Kubik Classic comes with a built-in update mechanism. One click to install the latest version. Holy [insert extrealy long word here]. Okay, enough gawking, time to download. Despite not having everything ready, I'm already in love with it. It works great, overlays nice, is very useful for newer players, and the chat feature is awesome. I'm kinda confused over the chat "registration," but since this is in Beta, I'm assuming that you just haven't implemented it yet. Anyways, great job, and keep it up. Sniper on The Voxel Box. Creator of the Coolpilot Productions. You downloaded minecraft.air as .air? If windows - open with Air, but it should automatic finds air... check again. The .air file you download will install the feature. If you can't find the .air program, look in your downloads folder (if you saved it). If it's not running, double check to see if you have the latest air. I downloaded minecraft.air.zip, can't get it to work. Help? EDIT: I'm running Snow Leopard. It's quite odd, the download thing. You'll have to right-click the download button and click "save as". Save it as: minecraft.air (Name it exactly that.) Then double-click that after downloading it and it should install for me. Ah, much better now, thank you. Have this as an enableable feature in-game. Where players that don't need it don't get the extra lag, and people that need it can turn it on :] or already have it on. Hey, Any chance I can have the source code? You did a great job on that program! Looks great. Pity that adobe doesn't support 64bit linux. Oh well. What platforms is it actually available on? Add to the OP? anyone know where the air application is located then? so I can manually run the file in it? This is wondeful, though I think more support with minecraft itself is needed. It'd be nice to be able to access it without pausing the game. This should definately help some new people to the game more conveniently, I wish I had it when I started out. This looks amazing! Maybe I'll download it after school. I just thought, this kinda makes up for Notch choosing not to update the game today(I think. I'm not really sure). If anyone has any ideas how to improve program, we welcome your suggestions. you force Minecraft to fullscreen? Cheers. But not Linux64? Any other restrictions we should know about?